Retro Friday Book Reviews are hosted by Angieville. Basically you review an older or under the radar title on Fridays. This Friday, I’m reviewing A Series of Unfortunate Events: The Bad Beginning by Lemony Snicket Audiobook. One man’s trash is another man’s treasure IS SO TRUE. Omfg you guys, as you may recall, I completely LOVED A Tale Dark And Grimm by Adam Gidwitz. A few people who did not like it mentioned being turned off by the narration technique which is supposedly very similar to A Series Of Unfortunate Events by Lemony Snicket. Friends, as SOON as I heard that I promptly put a hold on the first audiobook in the series – The Bad Beginning. I was NOT disappointed. The Bad Beginning by Lemony Snicket opens with a warning: If you are expecting a pleasant tale, read another book. The three Baudelaire children Violet, Klaus, and Sunny are at the beach when they discover their parents have perished in a house fire. Mr Poe, a banker, sends the children to live with their distant uncle, Count Olaf, based on the will which stipulates that the children must live with a blood relative. Count Olaf, FYI, is a giant douche. He uses the kids as slaves and tries to steal their considerable fortune. Oh, friends, how I LOVED The Bad Beginning by Lemony Snicket. It will appeal to a certain type of reader, mainly children, and people who are probably going to hell. For example, I dislike small children, so I wasn’t overly upset whenever something bad would happen to the orphans. I also love disruptive narrators. The third person technique is awesome here. The narrator keeps interrupting to warn the reader as well as to define words. You see, he defines words as a way of making fun of patronizing children’s books. I definitely laughed out loud. Disclosure: Borrowed from my public library. Tim Curry is awesome! I don’t know that I would have loved this so much if I hadn’t audio-ed it. Your post has just reminded me… we were given the Lemony Snicket movie as a gift years ago.. I can’t even remember when… still haven’t watched it. I actually really want to see the movie. I’ve read good reviews of it on IMDB. AND GOOD TO KNOW that when I have kids I will love them and won’t have to like other people’s kids. So so good to know that hahaha. fun! i love the lemony snicket books, but i actually have read the printed versions. i haven’t done the audiobooks but i freakin love tim curry. maybe i should go grab it from the library TODAY. seriously, i’m thinking about it. sometimes it is SO MUCH FUN to read something so dark and count olaf is just dark as hell. in reference to ashley’s comment above: i think you probably would have loved it just fine if you’d have read the printed version. it’s a short read, a great one for a readathon perhaps, but i can definitely see where the audio would pump it up. also, i’ve never read A Tale Dark and Grimm. hmm. i was charmed completely (read: i read with a smile & laughed out loud.) by The Bad Beginning so maybe i’d like it. YES. To it being fun to read dark books. And that Count Olaf is a sketch ball. Seriously. Also, I love readathon books. AND OKAY seriously the Tim Curry narration took this book and turned it to 11. And I think you would really like A Tale Dark and Grimm! I read this awhile back… a little before the movie came out, and I absolutely loved it. I’m kind of disappointed with myself that I was never able to finish the series, I started reading a bunch of other books! I think I’m going to have to make a trip to the library! Thanks for bringing back some great memories! I feel like that a lot too — I mean I get disappointed with myself when I don’t finish a series. The completionist within me says – HEY SELF – why do you ignore the next books in this series in favor of other things. Also holla for the library! I LOVE audio and I am always looking for suggestions – thanks for this! Yay! Audiobooks are the best! I agree with you 100% (the part about Tim Curry that is). We just took a road trip to Florida for school break and borrowed The Bad Beginning from the library for the ride. The book was so much fun that we bought #2 and #3 for the ride home. Tim Curry was truly amazing. Volumes #3-5 are narrated by Lemony Snickett himself. He did a good job but Count Olaf was just not the same. We now have plans to listen to the entire series and will have to get through two more volumes to get back to Tim Curry narrating. The series is worth listening to just to hear him. What a talent! Hi Wendy! Thanks for commenting. That’s really cool that you bought the books for the ride home. 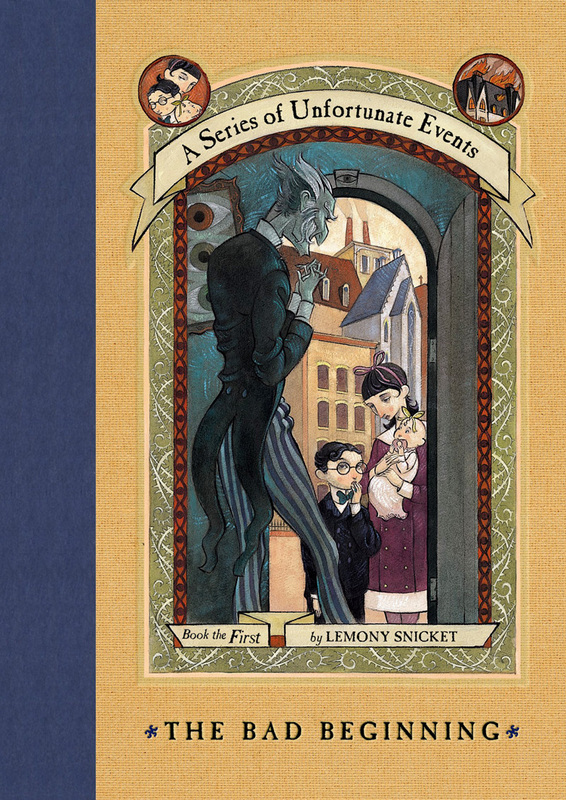 Also, I love Tim Curry as a narrator, so it makes me sad that Lemony Snicket narrates the next 3 volumes instead. I mean, I’m sure he is wonderful, but Tim Curry rocks. And dubs true on him being a talent!